Life’s more fun when you have your ruffles on. I have been a sucker for maxi dresses all my life. They are easy, comfortable and look chic from day to night. It’s probably my go to dress for any and every occasion. Whether it’s florals, solid color or even the latest trend Ruffle Maxi Dress. There is so much potential with this one outfit. To be honest, I was in two minds whether to buy a ruffle maxi dress. Unless you twirl in it, the dress looks pretty thanda, almost like loose pieces of clothing hanging from your body. So when I first put it on, I wasn’t the biggest fan of it at all. But once I broke the monotony of the outfit with a classic white leather jacket, it was a different look altogether. It kept me warm and did kinda go well with the whole look. But the magic of ruffles is when you show it off, and I had the perfect occasion for it. We were planning our year end trip to Rajasthan and I just knew this would fit like a dream. So I picked my day to wear this and pretty much twirled in every corner of Jodhpur. The idea behind this post came when multiple humans pointed out to me that I twirl too much. Pretty much everywhere I’ve travelled, I have a twirl picture of me somewhere. 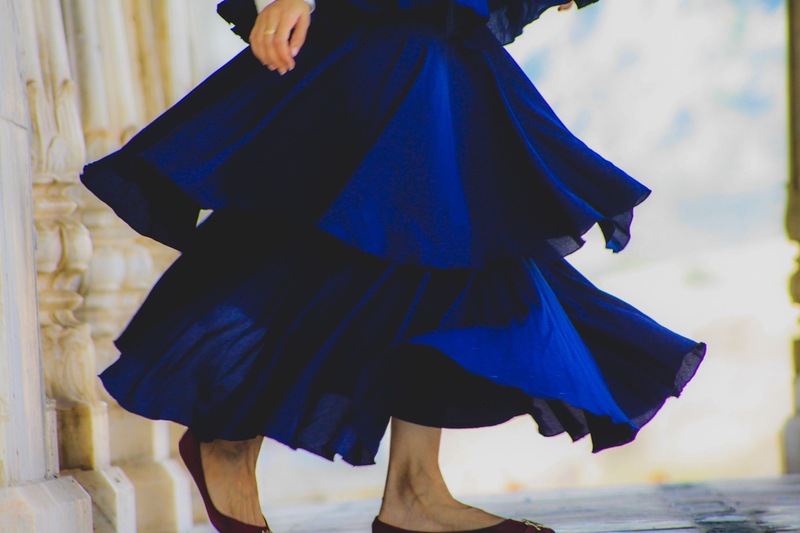 So I figured there might be someone out there who would want to know how to ace that perfect twirl 😛 If you are that someone, here are some tips that might come handy to you the next time you twirl. Blue was a easy pick. It looks great for a day shoot, and pretty much is a stunner when you twirl in it. I am so happy with this dress, I never thought it could be a dream Ruffle Maxi Dress. Some dresses just demand your twirl. This dress was that for me. It’s often hard to find the perfect frame with no humans around, if you know what I mean. Every place I twirled in Jodhpur, we had a crowd watching likr it was their business. At first, I was a bit shy, then I thought YOLO, let’s just get on with it. You know what, I got the best shots once I stopped looking at those amazed faces around me. Best decision ever. Do you love to twirl too? Which outfit style is your favourite for twirling?